I've been out of the habit of blogging, but we've got a meeting coming up for the Designing for Flexible Learning Practice module that I'm participating in. We've been asked to come to the meeting with Learner & Graduate profiles, so here goes. Our course attracts learners of a fairly wide age range. An approximate distribution is shown in the table to the right. 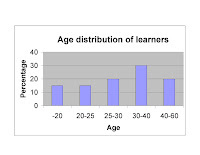 The bulk of our learners tend to be in the 30-40 age bracket, but as you can see we attract people ranging from school leavers to those who are fairly close to the end of their working life. The next chart shows the gender distribution of our current class. Women definately dominate in massage classrooms, but the male component of this group is slightly lower than a typical group. I'd expect males to make up 20-25% of a massage class. In terms of learning styles I like to use the VARK learning styles questionaire to assess our new students. The primary theme is always kinesthetic (as you would probably imagine in a subject such as massage), but other learning styles are also common (although I wouldn't say that any are really dominant). We currently offer an 18-month diploma of massage therapy, however from next year we anticipate offering a 1 year certificate in relaxation massage & stress management, and a 2 year diploma in therapeutic massage. The graduate profile of the 1 year qualification will be roughly equivalent to the scope of practice of a Certified Massage Therapist as defined by Massage New Zealand (MNZ), our professional association. The graduate profile of the 2 year qualification will be roughly equivalent to the scope of practice of a Remedial Massage Therapist as defined by MNZ. Unfortunately MNZ have a new website and it does not yet list these scopes. How did you get this data? Including the graphs? The age distribution is an approximation based on my experience. 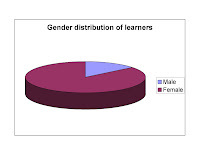 The gender distribution graph is for the current 2nd year class, but my 20-25% figure is based on experience. Hi Dave, I like the graph, what software did you use? It is a little misleading however because the 30-40 age range spans ten years when most of the other age ranges span five years. If all age ranges span five years what does the graph look like? I used Excel, printed to .pdf. Then I opened the pdf with Adobe Acrobat & saved as a .jpg. Slightly annoying process. I tried to save the image directly to an image file, but it was not possible. This is really interesting! Thanks so much for sharing! I have been looking into massage therapist grande prairie but it is great to see the results and data before I get into this! Thanks again for sharing once again! Hi Dave, Although I don't have numbers to post to agree, I would agree with your numbers and what we see here in terms of demographics that are the massage industry now. It's interesting how different the scientific, sports minded therapists are compared to the holistic health practitioners. Thinking of therapy via online chat for taste, habit, hunger ? Tuned into the best taste or looking at Chocolates, biscuits, chips, bacon, curry ? That's ok in balance. Our weight loss hypnosis treatments ensure your current weight will be healthier one. Anorexia, gastric band requirements, IBS, food addiction are areas we specialise in.